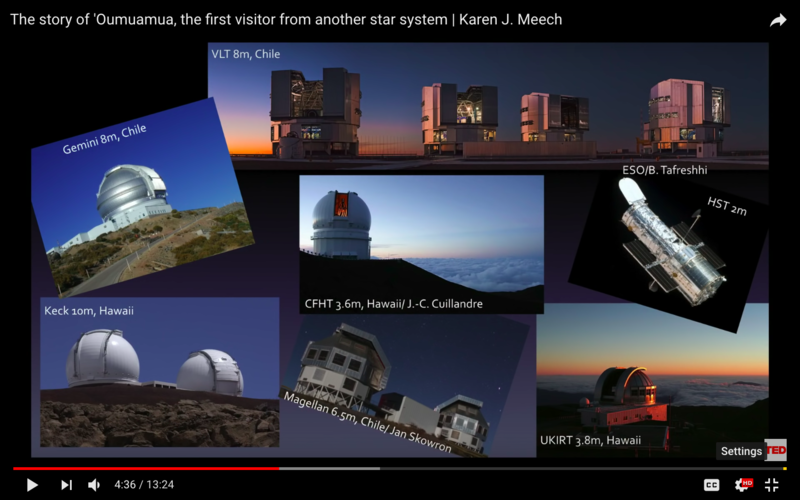 During the rapid passing of ʻOumuamua through our solar system, it was difficult to get instant telescope time. Usually, formal requests and a review process are necessary before telescope time is provided to a particular project. Now everybody is excited and eager to observe more interstellar objects. Did "they" set up an appropriate request procedure for immediate telescope usage for that matter? Or can one expect that similar hurdles and paperwork are required when the next such object is discovered? Is there any kind of international standard, or are such requests managed individually by each observatory? For observing "predictable" transient events (e.g. Gamma Ray burst or gravitational wave events), observers apply (i.e. write a proposal for peer review) for "target of opportunity" (ToO)time in advance. Typically, you might say we expect LIGO to give us 2 reasonably located, strong GW events dutring the next semester and we would like 3 hours of telescope time to follow each one of these up. If the proposal is approved, then the ToO time can be "triggered" by the proposers at any time (up to their maximum of 2 events per semester, or whatever they got approved for), by contacting the observers who are currently at the telescope and asking them to execute the ToO observing that they asked for. The current observers programme is interrupted (and they may not be compensated for this, other than perhaps co-authorship on a paper arising from the ToO). Totally unpredictable events like Oumuamua or a new Galactic Supernova have to rely on director's discretionary time (DDT). This is a fast track, way of getting some observing time. It is still peer-reviewed to some extent and only meritorious proposals will get any time allocated. Often a DDT proposal could be approved within 48 hours. If something truly extraordinary happened (and I would not classify Oumuamua in this way) that required observing right now, such as for example a local supernova, then I imagine that any observer at a telescope would be happy to break off what they are doing and point whatever instruments they had at it. It should be noted though that there is a risk here. At many observatories (for example ESO) you are only supposed to observe what you said you were going to observe. Departures from this can get you into trouble. A wise observer would seek permission from observatory staff/astronomers before chasing up some object somebody phoned up and asked them to observe. See https://www.eso.org/sci/facilities/paranal/sciops/ToO_policies.html for some more information on how these policies and procedures work at ESO. Most observatories have a pot of Director's Discretionary Time (DDT) available to respond to these sort of unexpected events that were not part of the regular (normally) 6-month proposal cycle. The procedure and how quickly they respond varies from observatory to observatory but generally you send an abbreviated proposal of what you want to do and how much telescope time it will need and it gets considered in a short time and granted time if appropriate. The kilonova last year and SN1987A would be other examples were these this has happened in the past. Not the answer you're looking for? Browse other questions tagged telescope observational-astronomy observatory oumuamua or ask your own question. What determines which frequency range a radio telescope has? How long does it typically take to make a telescope yourself for the first time? What is the largest object on which the Yarkovsky effect has been observed? Is it possible to use the stars to determine the passage of time? Has THC been detected in space? Has star KIC 8462852's 3 year long Kepler-fading continued after the primary Kepler mission ended? How should I find a telescope for research time?